• He makes the call. Literally. There is no office assistant or lackey who phones for Mr. Whan, then puts you on hold while the commish gets around to talking. He punches the buttons all by himself, which is momentous for its opposition to others in such positions. • It's never "Mr. Whan." In fact, it's not even "Michael." He instead introduces himself simply as "Mike." Again, that may not sound like much, but it's a personal touch others reserve only for the most informal moments. • He says thank you. Not at the end of conversations, which is pretty standard. No, he actually sends an e-mail thanking the interviewer later that day. I can count on one hand the number of times that's happened over the years. • The man is impressive. Rather than using terminology straight out of a commissioner handbook, he speaks in terms that are easily understandable. Most importantly, he speaks intelligently and with passion for his new pursuit. 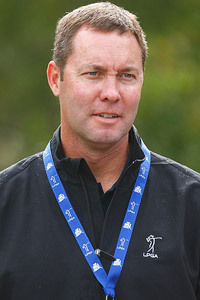 Scott Halleran/Getty Images Michael Whan hopes to have a LPGA Tour schedule that includes at least 30 tournaments a year. With that in mind, here is my Hot Seat Q&A with Mike. (Hey, he told me to call him that.) On the eve of the 2010 LPGA season debut, the commish discusses a potential dual tourney with the PGA Tour, the importance of Michelle Wie and the one thing he dislikes about the job so far. Q: You've officially been on the job since Jan. 1. What's the best thing so far about being LPGA commissioner? A: The best thing is the topic. If you think about my job, no matter where I go, whom I talk to, whenever I pick up my phone, the topic is golf. And if you grew up a golfer and you love the game the way I do, sometimes you have to pinch yourself and realize that every day in every meeting and every circumstance and every relationship, the binding glue is golf, so it's pretty special. No doubt it's a business. No doubt there are challenges. No doubt there are different personalities, but we do have that binding topic, and I never get sick of talking about golf. A: I think it's the misnomer that the commissioner sort of does everything, that without the commissioner there is no LPGA or no tour. Nothing could be further from the truth. Golf at its very basics is a very individual game. I mean, you've got to stand up on that first tee, and it's you against the golf course. But being commissioner is not. It's a team sport. And I'm surrounded by talent in the staff, the players, the coaches, the caddies, the agents. I'm surrounded by 1,300 women who are LPGA teaching and club professionals in our foundations where we help grow the game. So being commissioner, a lot of people give me way too much credit, as if this thing is all about Mike Whan, and nothing could be further from the truth. That frustrates me a little bit, just because I think it's unfair to the rest of the team. Being commissioner is a lot more like being CEO than it is anything else. What I mean by that is, as a CEO, you certainly have responsibilities, but the No. 1 responsibility is to be a good teammate and drive your team in the right direction. I'm not the ball carrier on this team, that's for sure. Q: What are some of the biggest challenges facing the tour right now? A: I think just opportunities. You know, we lived through with the LPGA the same thing everyone else did in 2008 and 2009, which is a real resetting in the business economy. People feel like they needed to pull in the shutters and kind of survive this last period. When that happened, a lot of people had to challenge, critique and question whether they still needed to be or wanted to be involved in sports entities that were different brand-building ventures, like the LPGA. I think the good news is that the world is coming out of that, which is exciting for me and the LPGA. And the other thing is -- and I've said this many times inside our building -- sometimes going through tough business challenges and tough business times makes you better. It sort of makes you sharpen your own pencil and make sure you really step back and remember what it is you're doing and why you're doing it. I've said this many times, and I believe it: I think our sponsors, our marketing partners and our players will benefit from a difficult 2008-09 economic time, because it's forced us to really get back and realized that we've got to be ultimate business partners to our sponsors. We've got to understand their business, not just our business. We've got to make sure that we're a smart economic decision, not just an enjoyable one. I feel confident enough to tell you that we'll be better because of what we've gone through. Q: I'm the CEO of a major corporation, potentially looking to take over title sponsorship of an event. Give me your sales pitch. A: Most importantly, my sales pitch starts off by listening to you. If I'm talking in the beginning and you're not, I'm making a mistake. I want to know what's going on in your business; I want to understand what your top four or five priorities are. I want you to tell me what happens in your board meetings. I want you to tell me the driving forces in your business. And then I'm ready to tell you about the LPGA, because my business only works if we can work together to help your business. Q: Tell me three things the LPGA needs to grow and succeed over the next few years. A: Well, first we've got to provide more opportunities in more locations and at more times to showcase the best female golfers in the world, so it's really all about putting our personalities and our performances and our players on display for the fans, the sponsors and for young girls all around the world to see their role models playing. The second thing is to find ways with our media partners to really embrace the differences of our players. I think the greatest thing about the LPGA is the stories; I mean, every girl has got an interesting story. We may not think about it sometimes, but when you meet a Jiyai Shin from Korea and realize that maybe 15 years ago, when she was putting a club in her hand for the first time, that may not have been a dream that is so believable as it might be today for the same young Korean girl. We've really got to embrace those players' stories so that other people can benefit from them. And then the last thing for me is just really opening up the tent to fans worldwide. What I mean by that is just inviting them to join us from all around the world. I'm excited to see what's happening on our Web site; I'm excited to see what's happening on our TV business in terms of the global interest for the LPGA. It's really an exciting time, and when you sit down and try to predict where the LPGA will be 10 years from now, it's an exciting forecast. Who else has appeared on ESPN.com's Hot Seat to discuss golf? Everyone from Tiger Woods to Jack Nicklaus. Q: Would you rather see a few superstars dominate the tour or parity throughout the ranks? A: The great news for everybody out there is that Mike Whan doesn't make that decision. The golfers will decide who steps up and takes it to a different level. I'm excited, because I think at the LPGA -- and I can't really speak to other golf or sports entities -- you have a difficult time predicting who are going to be the top two or three players in 2010, and I find that incredibly exciting. We really don't know who is going to be the next big name and the next big star, or whether or not it's going to be a handful of stars. I'm excited about that, because as a fan, the unpredictability of the LPGA is one of the best things that we have to offer. The simple answer to your question is that it doesn't matter what Mike Whan thinks. The players take care of that. Q: How important is the success of Michelle Wie to the tour? A: First and foremost, Michelle Wie is a phenomenal person and fantastic golfer; just loaded with talent. The good news is, isn't that great that she's playing on the LPGA? The other side of that story is, I could say the same thing about another 40-50 LPGA players, meaning phenomenal talents and great golfers and great people. Michelle Wie is a needle-mover; people come to watch her play, and they're excited when she has a chance at winning. But she's not the only one. She knows that, and we certainly know that. There is plenty of superstar talent on the LPGA. The most important thing I tell people, and I've said to her is, she's 20. I don't know what you were doing when you were 20, but when I was 20 there was certainly a lot of life still to come. I know we've all seen Michelle for a long time, so it's hard to believe, but at 20 her best golf is still to come. So I'm excited for her in terms of what the future might hold, but all you have to do is spend about an hour on the driving range at an LPGA event to realize just how many superstar talents there are who could really be the next big breakthrough. I wouldn't say the LPGA is reliant on Michelle Wie, but we are excited for her and with her, just as we are with a lot of 20-somethings who could really change the game. Q: Your schedule currently has 24 tournaments, down from 34 in 2008 and 27 last year. [Since this interview was conducted, that number has increased to 25.] What's the optimum number you'd like to see? A: The bottom line is, we need to be playing golf more than 30 times, and doing it around the world and doing it at some of the best venues in the world. But at the same time, we need to do it where it's right with our partners; we need to do it where it's right with our players. As I've said inside and I've said a few times outside, while I want to have more tournaments, I want to have more opportunities for the women to play, and I want to make sure that we're playing more often. We don't need to rush. We don't need to make silly decisions. We need to be thinking long-term, just like our founders did and just like the people who followed our founders. I find that people get way too focused on the number as opposed to being focused on the quality. I'm going to focus on quality tournaments and quality sponsor relationships, and I'm quite certain that number and the opportunities will take care of themselves. Q: Nearly half of these events are outside of the United States. Is there greater growth potential domestically or internationally? A: I don't know which I'd say is greater. I will tell you that there is growth potential domestically and there is growth potential internationally. The real challenge of the job is managing that potential, not from a standpoint of just adding tournaments, but doing it in an intelligent enough way that our fans can follow it and our players can play it. The good news is our fan base and our sponsor base is literally worldwide, and so we need to reach out to that worldwide fan base. I think it's probably tied to the economic recovery, but I'm excited at the amount of domestic interest. I had been told by others who aren't at the LPGA, "You're really challenged to find the right domestic opportunities." I disagree with that, because I'm excited about the domestic interest that is clearly there or clearly started. Q: I've been floating the idea of a combined PGA Tour/LPGA event for a long time. Is that something you would be interested in? Have you inquired with Tim Finchem about interest on their end? A: It is something I'm interested in and it is something I've asked commissioner Finchem about, yes. Q: And what has been his response? A: You know what I'll tell you about commissioner Finchem is, first and foremost, I couldn't have envisioned a better first meeting and a better partnership feeling. I mean, I really felt that he was going to be there as a resource for me personally. The commissioner job is a unique one, and there's not many people who can give you advice about being a commissioner, simply because the job itself is so unique. He was probably in the first 50 people to e-mail me when I took the job and said, "As soon as you're ready, you come see me." And that's exactly what I did. I think in my fifth day in the office I drove to [PGA headquarters in Ponte Vedra Beach, Fla.] and spent a few hours with him in his office, then met with a lot of others on his staff. I cannot imagine a better partner. He may or may not be excited about the fact that I've e-mailed and texted a few times since that meeting, just because the fact of the matter is he can help me from a guidance-counselor position that many people can't. I was excited to hear that he agrees, that our players together with his players make an interesting idea. At this point, it's just two commissioners saying it's an interesting idea, but good things start that way. We're a long way away from talking about in formal terms any kind of LPGA/PGA effort, but I think we both agree it's an intriguing idea, and we'll take the idea and see if it spurs to something more. But to say it's anything more than two commissioners mentioning it in an otherwise long conversation? That's really all it was. Q: Until that time, how about 18 holes of match play, you versus Finchem? Think you can take him? A: I have no idea what kind of golfer he is, but if you give me six months, I'd be up for it. I'm not sure I'm going to get on the golf course in the next six months, but that's OK. I've had more opportunities to play than in my entire life and I've had less interest to spend five hours playing golf. I'm ready to go, and so right now I don't want to take five hours to golf. There's too much I want to do. Q: Obviously, the current absence of Tiger Woods leaves a huge void for the PGA Tour. Can the LPGA capitalize on this, or does it not affect your tour? A: Is Tiger Woods missing? Q: You're that wrapped up in the new job, huh? A: No, I think you'd actually have to be underground. But you're right; Tiger has kind of been the face of golf for so many years, I think that's true. And I think there is an opportunity. I think fans love the game, and they're going to love the game with or without Tiger. We've proven that before and we'll prove it again. But to your point, I think our brand of golf and our excitement and our on-course personality displays, as I've said to many fans in different forums already, if you haven't watched an LPGA event or haven't gone to one, you're going to be blown away if you do in 2010. One thing I would tell you about people who go to an LPGA event: When they drive home, the one thing that they talk about is they feel like they've met some of the players. Whether you have or you haven't, you feel like you have, because the accessibility, the closeness and the showcasing of personalities is special on our tour. I hope people who may not have watched or sampled our business in a while do, because I have no doubt that our tour takes care of itself. Our product is exciting, and if you come watch it, you'll know.